For the fourth year running, Wigan Athletic will be showing their support for Wigan Pride by helping to sponsor the event in the town centre on Saturday 10th August 2019. This year’s event will highlight equality and diversity, and will also mark 50 years since the Stonewall riots in New York, which led to the development of the gay rights movement across the world. Each year, Latics support the work of Football v Homophobia, with players warming up in branded t-shirts and members of the U18s squad taking part in an educational workshop. Wigan Athletic Community Trust will be working closely with Stonewall, a lesbian, gay, bisexual and transgender rights charity in the United Kingdom, and the Premier League to provide training to its staff about how to make sessions more inclusive to LGBTQ young people. 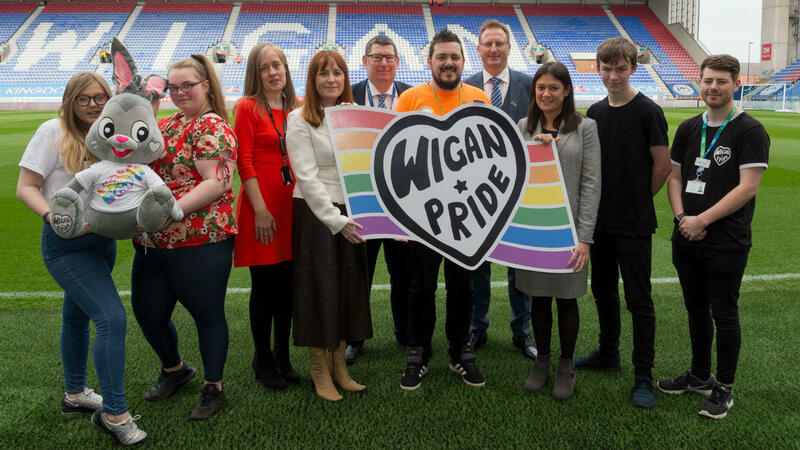 Jonathan Jackson, Wigan Athletic Chief Executive, said: “Wigan Pride celebrations over the past three years have been excellent events which have helped to bring communities across Wigan together to highlight equality, diversity and respect in our borough. Taking place in the town centre from 11am-5pm, Wigan Pride will be a day of entertainment for the whole family, with activities including a street parade, arts, crafts, music and more, while club staff will be present at the event to showcase the work of the award-winning Community Trust. Daniel Bonney, Vice Chair of the Wigan Pride Committee, said: “We’re so grateful and proud to have the support of Wigan Athletic for a fourth consecutive year. As an event organised by a voluntary multi-agency committee, we are solely funded by our partners and sponsors so it is amazing to have the support from one of the borough’s major sports teams. He added: “From taking part in the Football v Homophobia activities to their work with Stonewall, it’s great to see the club being so inclusive and taking a stand for the local LGBTQ+ community. Interested in getting involved in Wigan Pride? Would your business like to become a sponsor the event? Please visit WWW.WIGANPRIDE.COM or email us at info@wiganpride.com. 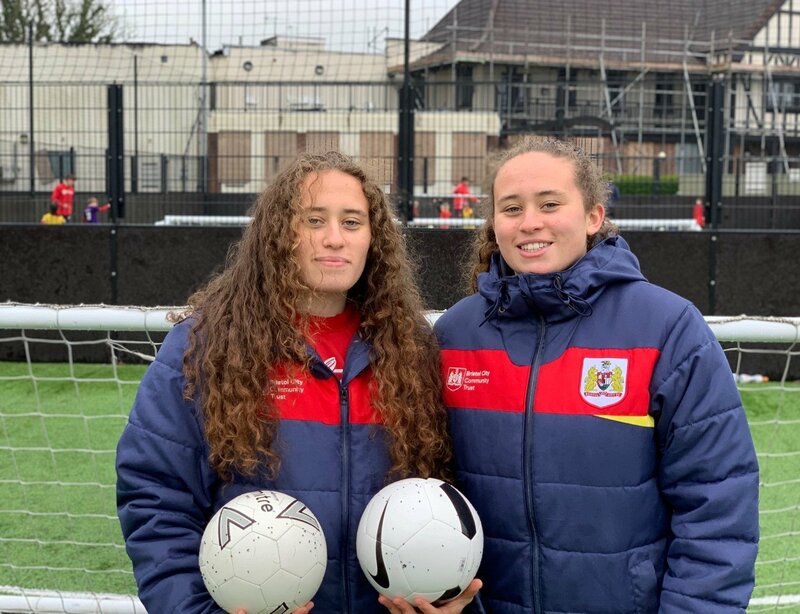 On National Siblings Day we showcase the fantastic work of twin sisters Grace and Lauren Phillips who are second year students on Bristol City Community Trust’s football and futsal BTEC level 3 extended diploma in sport programme. After excelling in their studies, they are both on track to achieving the grade of triple distinction star in their sports diplomas, a result which has led them to receiving offers to continue their studies at Gloucester University next year. As well as exceeding in the classroom, the two sisters are key players in the Community Trust’s women’s futsal team and have played an integral part in the teams journey in making it to the National Finals which will be played at England’s St George’s Park next month. As well as studying with The Robins, Grace and Lauren are also members of the Trust’s Youth Council – a body of eight young people who help to shape the work done at the Community Trust – and have been since the council’s conception nearly three years ago. During their time on the Youth Council, the twins have been involved in representing the Trust at Parliament during last year’s regional EFL Awards event and they have both received national recognition for their work after winning the 2017/18 FA Women’s Football Award for ‘Best Participation Initiative’ for the Trust’s ‘Future Fives’ initiative – a programme which they masterminded. 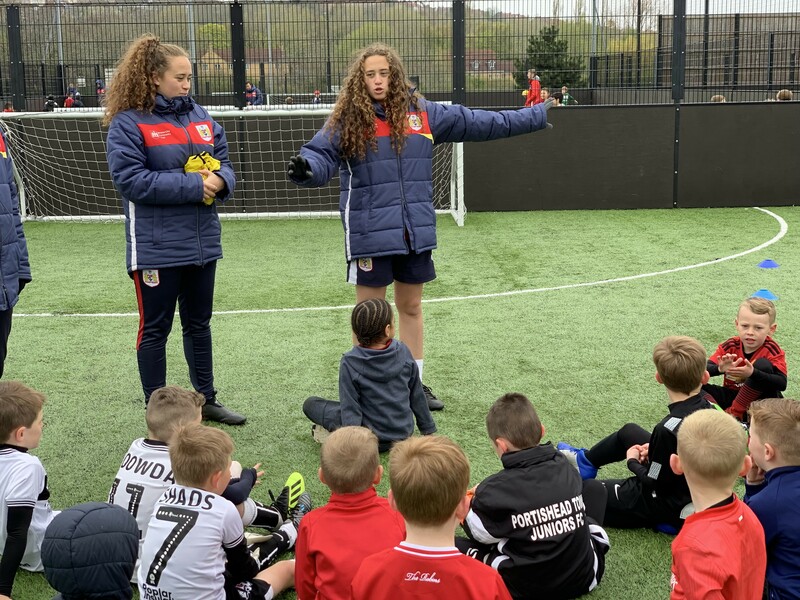 In addition to this, Grace and Lauren have each spent over 400 hours volunteering with the Trust on various different projects and programmes and are currently working at Easter Holiday football camps. Head of Education at the Trust, Chris Stenner, commented that, “Lauren and Grace are two inspirational young women who have given a lot back to their local community. 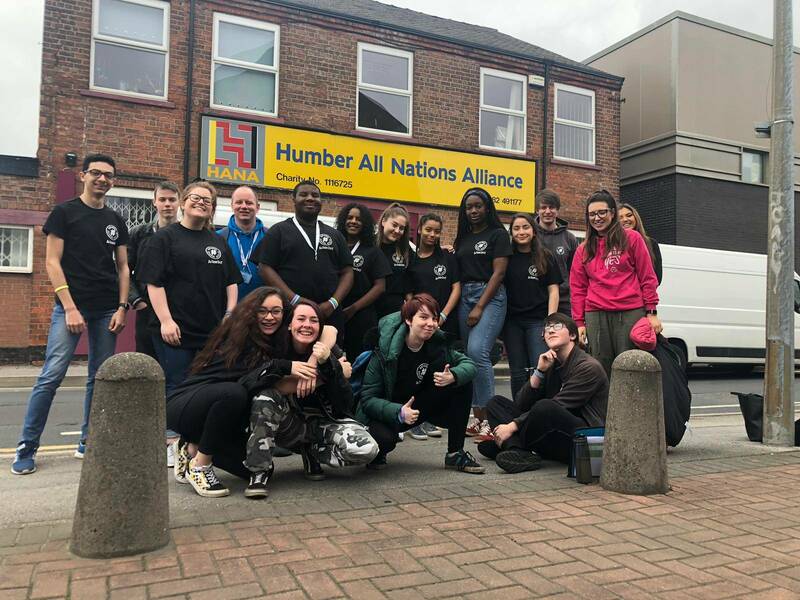 17 teenagers from Yorkshire and Humber dedicated their time to help a homeless family move into a house as part of NCS Action Day. 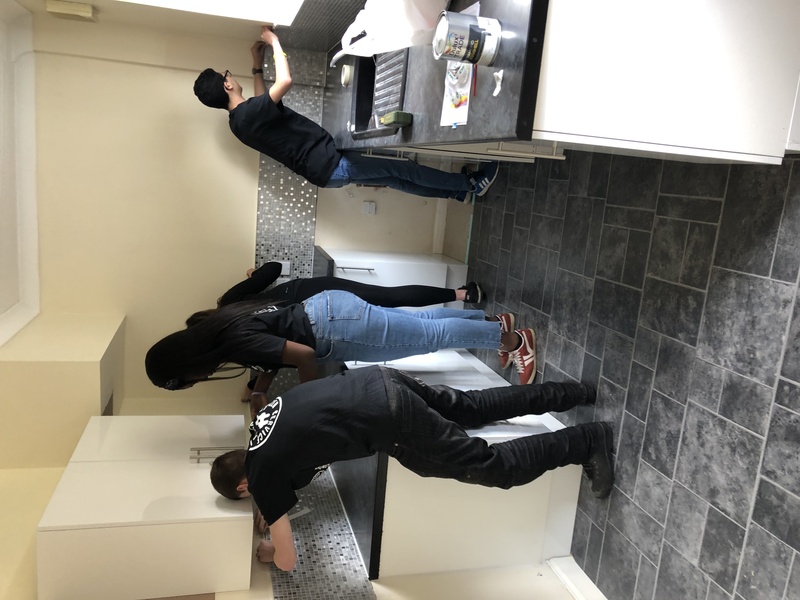 Partnering with Hull Homeless Community Project (HHCP), the group undertook a project to redecorate a house giving a homeless family the best possible start in their new home, as well as giving a fresh lick of paint to the HHCP offices for the community to enjoy. In one day, the group had achieved what they set out to do, as they repainted every room and moved furniture into the house and as a result, a family in Hull were given a foundation to restart their lives in a new home. Prior to their project, the group also raised funds through a charity football event and bake sale. The money raised was used to buy items such as tinned food, pasta, rice, sanitary products, and toiletries for care packages that will be distributed across three homeless charities in Yorkshire and Humber, (HHCP, The Welcome Centre (Huddersfield) and Ben’s Centre (Sheffield). “I’m incredibly proud of the team and how our social action project went. “It feels amazing to have pulled off such a large project and for the group to come together to help others. Jaz and the other young people are part of the Regional Youth Board after completing NCS (National Citizen Service) with EFL Trust (English Football League). 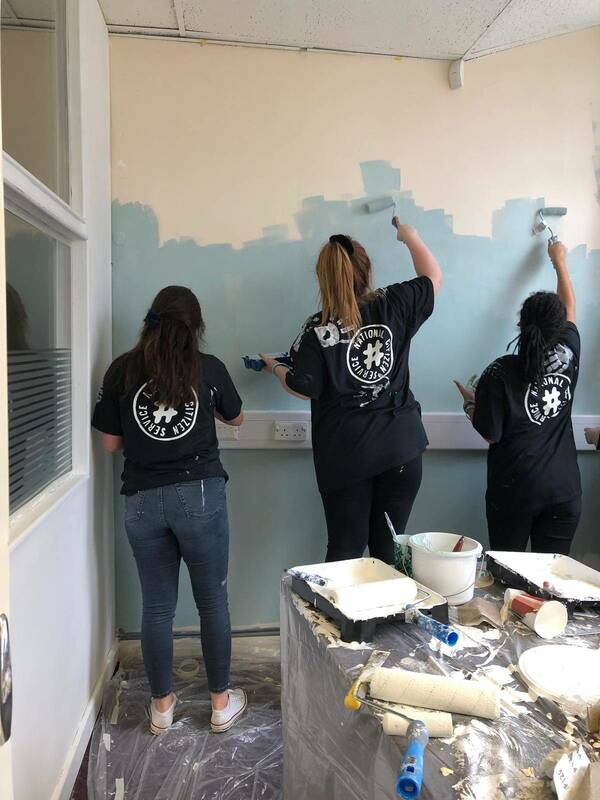 Their project was part of an annual event, NCS Action Day, which aims to showcase the true power of young people as NCS graduates, using the skills and experience they gained on programme to continue to make positive changes in their local area. “The difference they have made was instantaneous, our client was lost for words when she saw her newly decorated home. All teens involved have completed NCS with EFL Trust through their local football Club or youth organisation. In 2018, NCS graduates from EFL Trust delivered over 130,000 hours of social action, raising of £100,000 for local charities in Yorkshire and Humber. To find out more about the NCS and Action Day visit ncsyes.co.uk. Working across all age groups and sections of the community from healthy eating sessions in primary schools through to sessions helping those suffering from dementia. Extra Time Hubs is a national project from the EFL Trust that is delivered by 12 EFL Clubs. The Hubs harness the power of football Clubs in the local communities to bring people together and improve health and well-being. The project, that was made possible thanks to National Lottery funding from Sport England, aims to bring together retired and semi-retired people, getting them involved in a range of activities such as arts and crafts, table tennis, walks, talks, bungee jumping, quizzes and music in their free time. 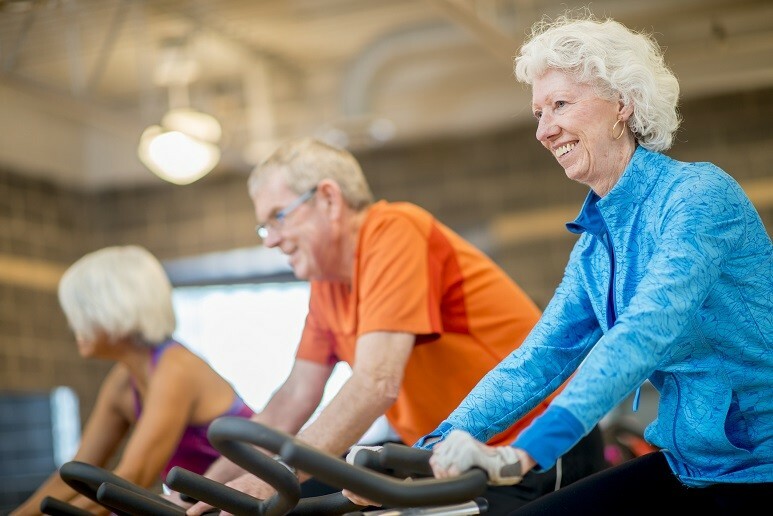 Those involved have the opportunity to meet and spend time with like-minded people in their area, proving that you’re never too old to learn to do the things you’ve always wanted to do. 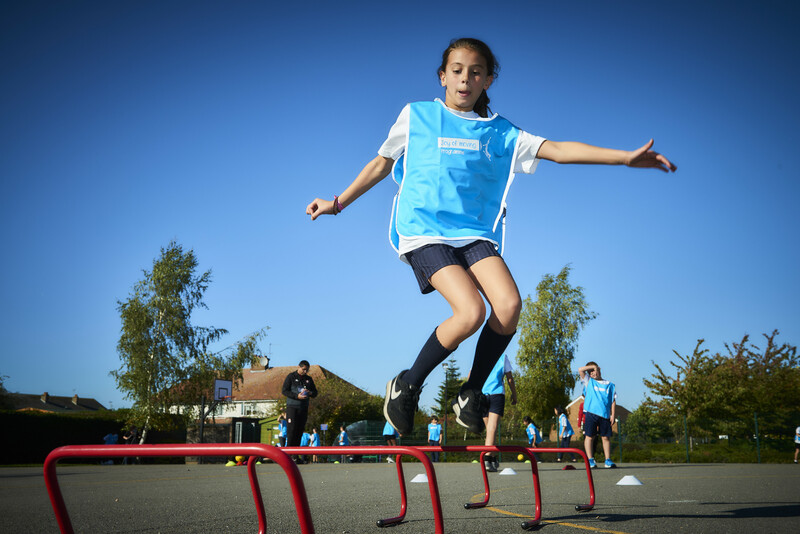 The Football Fans in Training scheme, delivered by 5 EFL Club Community Trusts [Swindon Town, Wycombe Wanderers, Blackpool, Middlesbrough and Charlton Athletic], is aimed at overweight football fans, encouraging them to lose weight, get fit and live a healthier, more active life. Fans on the scheme take part in a 12-week training programme delivered by Club community coaches at their team’s home stadium. They are also grounded in current science of how to eat more healthily and become more active. 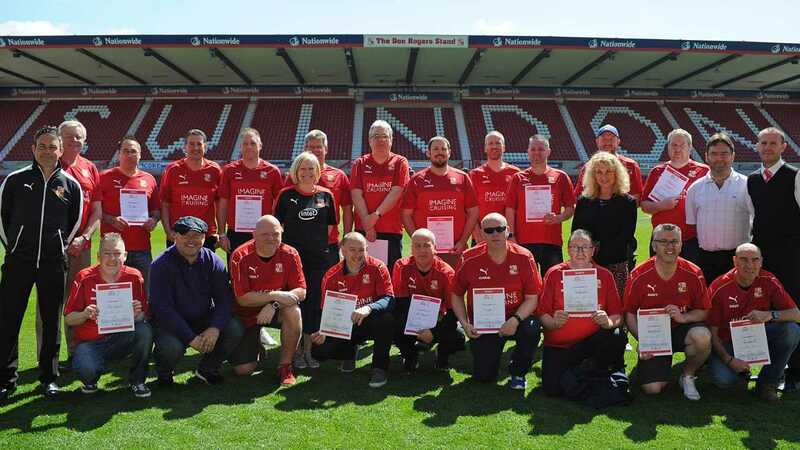 Since running the FFIT project, Swindon Town FC Community Foundation have helped more than 200 fans lose more than 250 stone collectively. One participant in particular on The Robins’ programme, Dave Potts, was the biggest loser out of the group that ran in 2018, after losing nearly 3 stone and 16cm off his waist (16.3% of his starting weight). Talking about his experience on the programme he said: “Since starting the Football Fans in Training programme I’m a lot fitter, sleeping better and I’m lot happier. “The result that was a real shock to me was that my blood pressure has come down by over 15%. 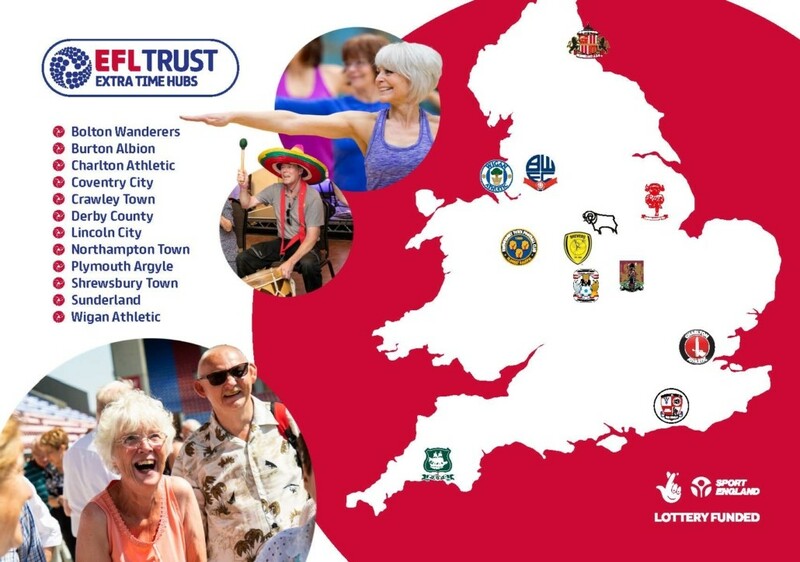 Mike Evans, Director of Operations at EFL Trust said: “The EFL Trust is committed to improving the lives of people within EFL communities across country and Football Fans in Training is proven to be a great way to get people to think about sustainable changes to improve their lives. 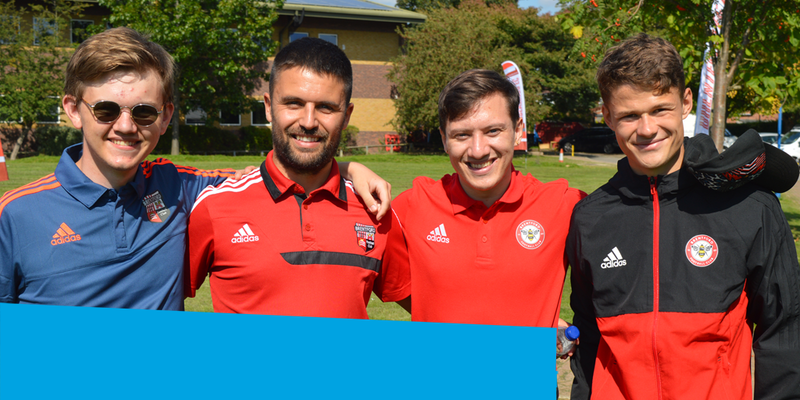 Volunteering for his local Community Sports Trust was not something Tom Campbell (pictured far left) could have envisaged when he joined Brentford’s disability projects twelve years ago. Tom, who has autism, joined the weekly football sessions to support him with his social and communication difficulties. His parents’ motivation for joining the project came from his difficulties in social situations; yet our ‘On the Ball’ project proved to be a turning point for Tom. With football always being a personal passion, he found his vocation and, over the years, took on some leadership roles within the session. The Trust’s ‘On the Ball’ project aims to tackle mental health problems on the heart of the football pitch. The ten-week programme supports children – aged 5-11 years old – who have autism or learning difficulties in west London. 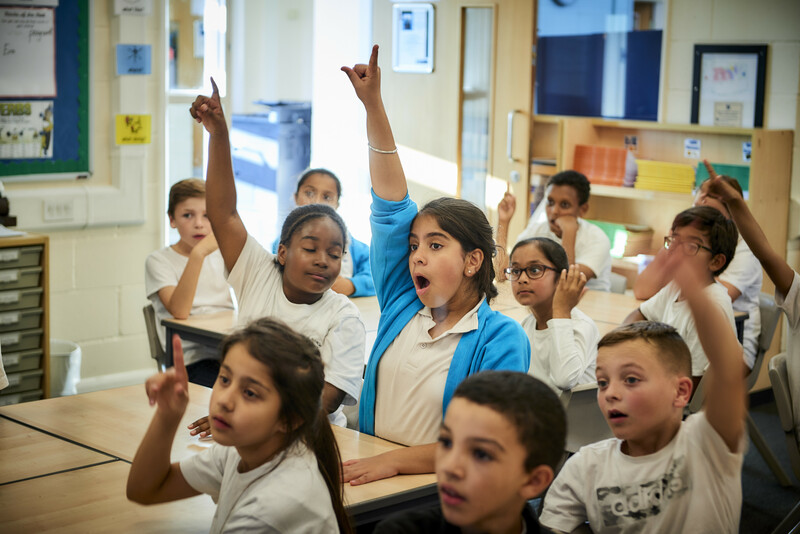 The project is delivered in partnership with Action Attainment, a charity in west London that is committed to enabling children with speech, language, communication and sensory needs to achieve and have active lives. “The Saturday morning football sessions have become a regular component of my week; I have been going for at least 12 years now. I have improved my physical fitness, coordination and strength, and it has given me something of real value to do on the weekend. This project had such a profound effect on Tom that he began volunteering for the Trust three years ago – supporting the Trust’s disability projects and taking on the role of Assistant Head Coach. “Volunteering has been a learning curve as I have learnt how to handle many different types of people from different backgrounds and different physical difficulties,” Tom said. And Disability Manager for the Trust, Chris Tribe, believes that Tom has flourished in his role as a volunteer – becoming a role model for other children who have autism. “When Tom first started, he was very anxious and reluctant to join in with the activities,” Chris said. Last year, Tom started full-time employment, and he credits his volunteering experience with helping him gain this role. And despite him kick-starting his professional career, you will still see Tom coaching the Saturday morning sessions – giving back to the project that helped him all those years ago. A record number of over 200 teens in Yorkshire and Humber will be giving up their time to tackle issues such as homelessness, loneliness, cultural divides and mental health as part of Action Day, a national movement organised by National Citizen Service (NCS). 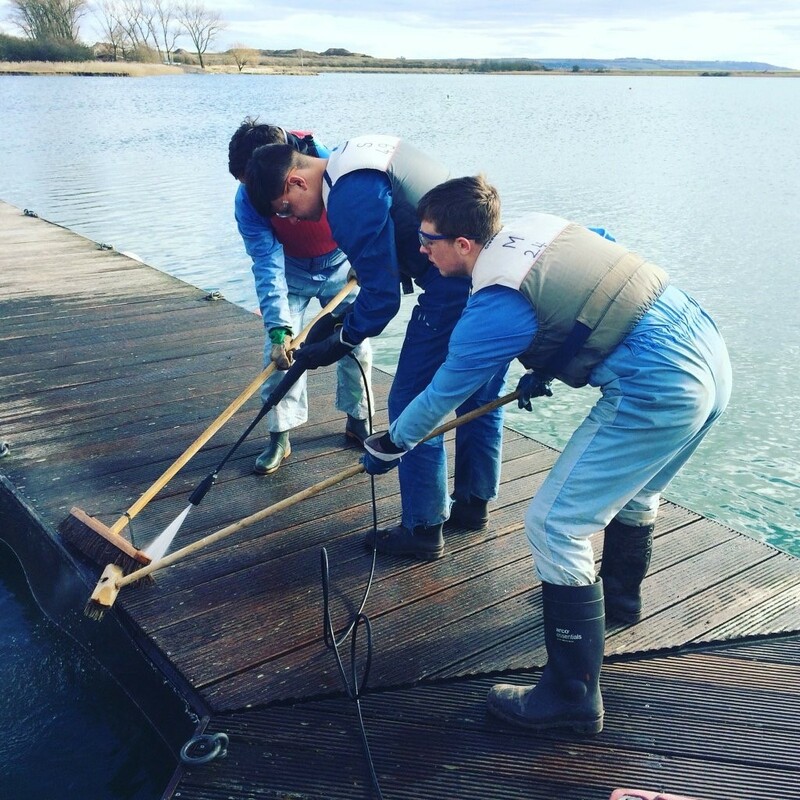 Action Day is an annual event which aims to showcase the true power of young people as NCS graduates use the skills and experiences gained on the programme to continue to make positive changes in their local area. In 2018, NCS graduates from EFL Trust delivered over 130,000 hours of social action, raising over £100,000 for local charities in Yorkshire and Humber. Teens from Reds in the Community (Barnsley FC) hosting an open event for homeless people offering food as well as services such as job centre advice and haircuts. Doncaster Rovers’ Local Youth Board hosting a ‘Country and Western’ evening to tackle loneliness in elderly people in Doncaster by integrating them with young people. 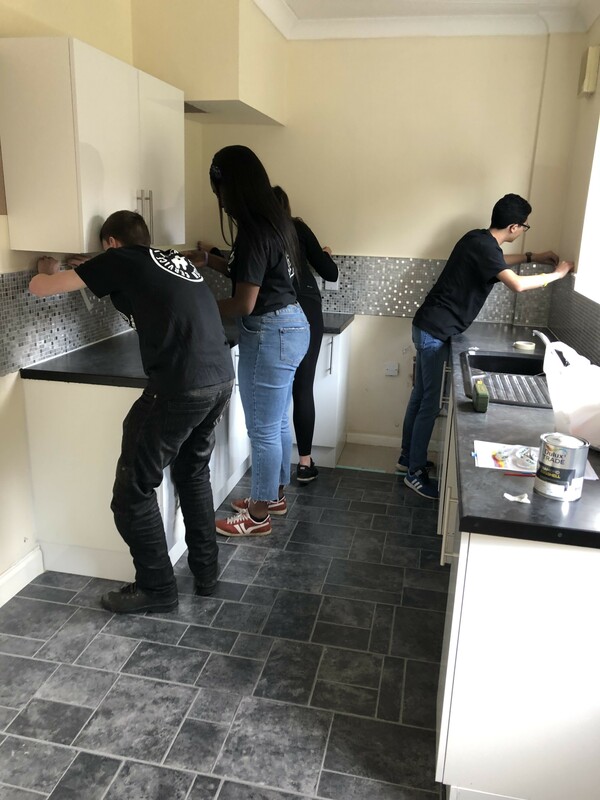 A group of teens from Hull renovating a house which is to be occupied by homeless people as well as distributing care packages to homeless people across the city. Teens in Sheffield will be raising awareness of mental health at Sheffield Wednesday’s home fixture against Nottingham Forest. Across the other side of the city teens from Sheffield United will be handing out care packages to the homeless. All teens involved have completed NCS with EFL Trust through their local football Club or youth organisation. After completing the initial programme, participants become NCS graduates who have access to a wide range of opportunities and support to continue making their mark in their communities. To find out more about the NCS programme or to sign up visit ncsyes.co.uk. St Joseph’s Catholic Academy win the 2019 EFL Girls Cup! 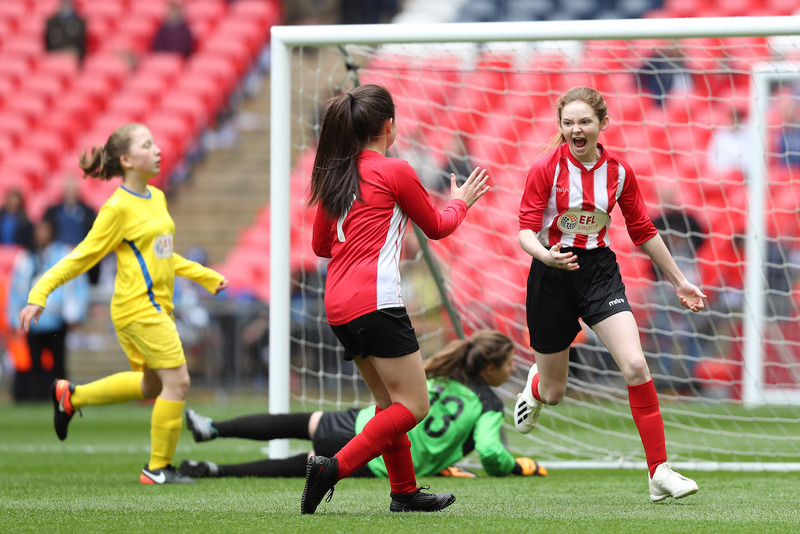 St Joseph’s Catholic Academy won the 2019 EFL Girls Cup on Sunday, with both themselves and Mangotsfield School putting in a performance to be proud of at the iconic Wembley Stadium. In what was an excellent contest and a fitting end to this year’s competition, St Joseph’s – representing Checkatrade Trophy finalists Sunderland – won 3-1 against their opponents, who were representing Bristol Rovers. Before kick-off, there was a special surprise in store, as England international Jordan Nobbs gave both teams a pre-match team talk and posed for photos. The game itself was the perfect precursor to the Checkatrade Trophy Final, with fans of both Sunderland and Portsmouth getting behind the girls. Jess Harvey gave Mangotsfield School the lead with a superb finish, but another well-taken goal, this time from Sophie Greener for St Joseph’s, meant it was level at the break. After the interval, Greener also claimed an assist, with a piece of individual brilliance seeing her set up Eve Parker to fire home. Parker then scored her second to seal the win and the trophy, going through on goal and slotting the ball into the bottom right-hand corner. Both sides received medals in the Royal Box after the game in recognition of their fantastic achievements in the 2018/19 Girls Cup, and St Joseph’s lifted the trophy to great applause around Wembley. Alicia Berry, Assistant Curriculum Leader of PE at St Joseph’s Catholic Academy who was there on the day to support the girls said: “It’s hard to put into words how I’m feeling to be honest. Everyone at the EFL Trust would like to congratulate both teams and thank them for their part in what was a memorable day for those involved. https://www.efltrust.com/wp-content/uploads/2019/04/rexfeatures_10182977ao.jpg 3580 5370 EFL Trust https://www.efltrust.com/wp-content/uploads/2016/06/efltrustlogo.png EFL Trust2019-04-03 10:00:332019-04-03 16:16:52St Joseph's Catholic Academy win the 2019 EFL Girls Cup! 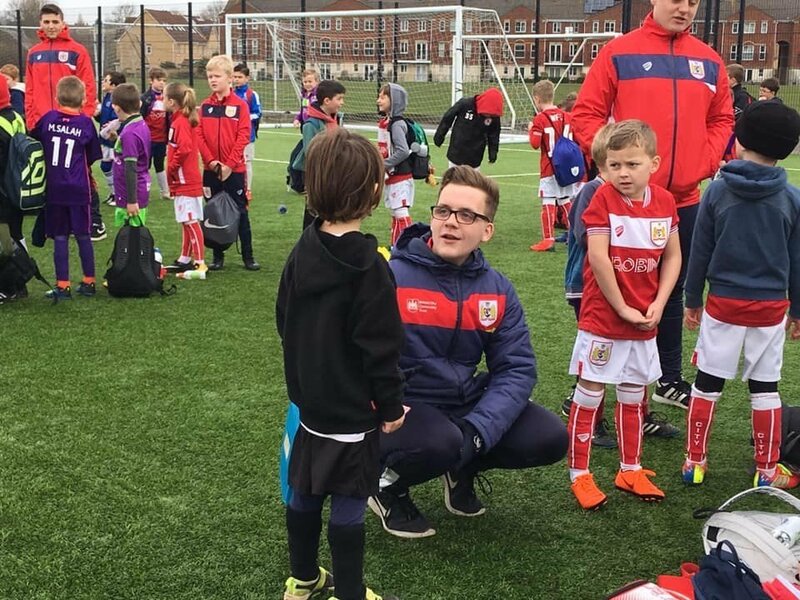 Dec Stone is a current student on the Bristol City Community Trust’s Sports Media course and is a member of the Community Trust’s Youth Council. Dec, who is also autistic, was selected to be part of the Trust’s Youth Council – a body of eight young people who help to decide and shape the work that is conducted at the Community Trust – in the role of Media Manager as a result of his excellent social media skills. Dec has now been a member of the council for nearly three years. Over this period of time, the council have helped the Trust to launch initiatives such as the Women’s and Girls football and fitness hub, and a Friday night social inclusion football session – which delivers football to 80 young people per session and has drastically reduced criminal activity in the area that it operates. The work of Dec and the rest of the Youth Council has been recognized on a national level and has won both EFL and FA awards. In addition to this, the work of the Youth Council played an integral part in the Trust winning the award of Community Club of the Year in 2018 and retaining it in 2019. When Dec first joined the Youth Council, he was quite an introverted individual who lacked self-confidence, however since then, he has grown into a confident individual and is a prominent member of the council. Dec’s confidence has grown to such an extent that he now works on multiple Trust projects as well as holiday camps where he works as Lead Coach for several of the sessions. Dec told Bristol City Community Tust that: “When I first started at the Youth Council, I was way out of my comfort zone. However, I did not let this dissuade me from perusing my goals, and I am so proud of all that we have achieved. https://www.efltrust.com/wp-content/uploads/2019/04/1.jpg 720 960 EFL Trust https://www.efltrust.com/wp-content/uploads/2016/06/efltrustlogo.png EFL Trust2019-04-02 15:22:522019-04-02 15:27:57Dec's story: ''If you really want something and work hard, you can do anything."